The theme of last year’s World Expo in Shanghai was “Better City, Better Life”. In the course of six months, no fewer than 73 million people visited its pavilions. “Better City, Better Life” is a theme that resonates in Shanghai, a dynamic and beguiling city which has seen many changes. It was a market city in the Song Dynasty (AD 960-1279), a major treaty port in the nineteenth century, a semi-colonial city in the 1920s and 30s (when it was known as “Paris in the Orient”) and a socialist city of six million people in the 1950s, before being reborn after 1990 as a capitalist city, a “dragonhead” tasked with driving the economic development of the whole region. Now China’s largest city, with a population of some 20 million, it is among the largest metropolitan areas in the world. The pace of change in Shanghai has been truly breathtaking, but it is not an isolated example. Few other countries can match the rate of urbanization in China, which has fifteen of the world’s 100 fastest-growing cities containing a million or more people. Half of China’s population is expected to leave the countryside for the cities by mid-century and it was recently estimated that some 50,000 skyscrapers will be built there in the next twenty years. A tide of urbanization is sweeping across Asia and indeed the planet. People are moving to cities in unprecedented numbers, particularly in the developing world. During the last decade we crossed a major threshold – for the first time in our history we became a truly urban species, with more than half the world’s population living in cities. It is anticipated that within the next twenty years some two thirds of the planet’s population will be city dwellers. Today we are living in the age of the megacities. Ancient Rome – the capital of an empire that stretched across three continents – was the first city to reach one million inhabitants. After Rome’s fall, the city’s population plunged as low as 10,000 during the Middle Ages. At this time, the world’s largest cities were to be found in the Islamic world. 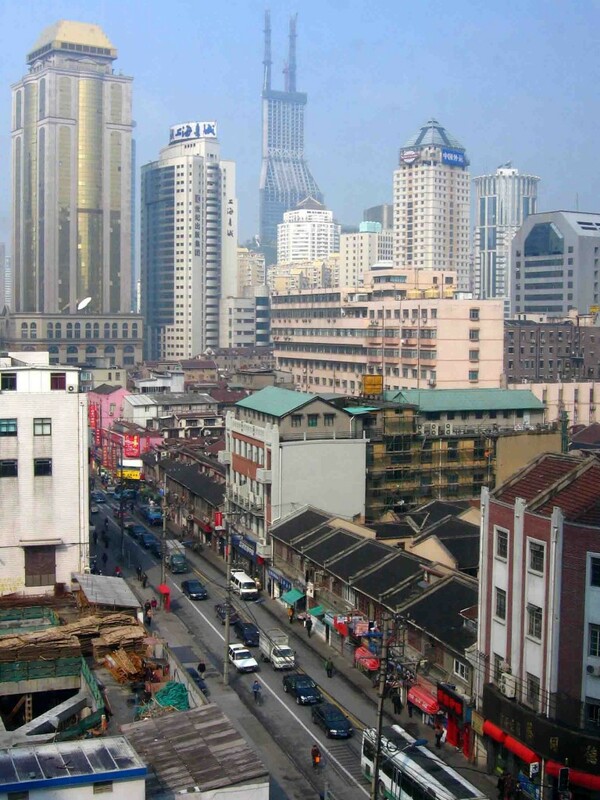 By the Renaissance, it was China’s cities that could lay claim to be the world’s biggest. Europe’s urban revival began during the fourteenth century, with cities like Florence expanding to some 100,000. By 1650, Paris was Europe’s largest city with 400,000 inhabitants. But it was the Industrial Revolution that fundamentally transformed people’s understanding of cities: in a generation, factory smokestacks replaced church steeples as the tallest structures on urban skylines and the dark Satanic mills drained the surrounding countryside of its population. Manchester (aka “Cottonopolis”) went from being a market town of 43,000 people in 1773, to a city of 80,000 in 1801. Fifty years later, 300,000 were living there. The archetypal industrial boomtown, Manchester’s meteoric rise generated immense riches for its businessmen but condemned their workers to the kind of squalid living conditions that so appalled Engels and which are sadly still with us in the slums of today’s boomtowns, such as Mumbai. By 1800, London was already the largest city in Europe and probably the world, but in the course of the nineteenth century the population of the Big Smoke rose from just shy of a million to an unprecedented 6.5 million. However, in the next century it was New York City that became the most famous metropolis of the age and the world’s first megacity – a city of more than 10 million people. By the start of the twenty-first century, there were nineteen megacities, only four of which were in industrialized countries. By 2030 that figure will rise to about forty. Tokyo is currently the largest, home to an astonishing 36 million people – more than live in the whole of Canada. But such cities are often part of even larger urban systems. The Tokyo-Nagoya-Osaka corridor is a sprawling urban agglomeration of up to 80 million people – a megalopolis that offers a glimpse of what the urban future may look like. These vast city regions are themselves linked to others around the world by communications networks and the global economy. As Edward Soja has said, “not only is urbanization increasingly reaching everywhere, everywhere is increasingly reaching into the city”. In the age of globalization, cities are becoming ever more important – London’s economy ranks as the ninth largest in Europe, larger than the national economies of countries like Austria and Greece. The importance of today’s global cities is a reminder that many of them are older than the nations and states of which they are a part. This encyclopedia is a testament to the intellectual breadth of urban studies as a field, as well as to its significance and global scope. Scholars from around the world have contributed to what is an invaluable research tool for anyone studying aspects of both urbanization (the growth of cities) and urbanism (city life). It is a wonderfully rich reference work, with essays ranging from the history of the city (“Acropolis”, “Medieval Town Design”, “Caravanserai”) and urban culture (“Flâneur”, “Hip Hop”, “Photography and the City”, “Urban Novel”), to architecture (“Arcades”, “Bunkers”) and contemporary urban issues (“Crime”, “Sprawl”, “Nuclear War”). There are also entries on specific cities as well as biographical pieces on major figures in urban studies, such as Mike Davis and Henri Lefebvre. The length of contributions varies from about 800 to 2500 words, many with illustrations and all with helpful suggestions for further reading (sometimes as many as a dozen scholarly articles and books). There is some duplication of material, as in Hutchison’s piece on “Urbanism” and Alan Latham’s on “Urban Life”, both of which explore the same classic studies by Ferdinand Tönnies, Georg Simmel, and others. The standard of writing is also somewhat variable, both as regards style and content. Most essays are well-written and authoritative, summarising research on a subject and situating it in a historical context. A few (perhaps by scholars for whom English is not their first language) could have been improved with more careful editing. Some are also overly theoretical and laden with jargon. (In one a piazza is memorably described as “a heterogeneous space with open borders”.) But the majority manage to weave theoretical, historical and architectural aspects into readable essays. Surprisingly, there is no individual entry on slums. Instead the index redirects the reader to a number of other essays (“Banlieue”, “Favela”, “Ghetto”, etc). Rapid urbanization means that 12-15 million new households are added to cities in developing countries each year, most in the slums. Many of the new megacities are in the poorest countries, such as Dhaka in Bangladesh and Lagos in Nigeria. As Mike Davis has said in his study Planet of Slums (2006), “instead of cities of light soaring toward heaven, much of the twenty-first-century urban world squats in squalor, surrounded by pollution, excrement, and decay.” Such rapid, intensive urbanization without industrialization is a new phenomenon. It is driven not by general prosperity, but by high birth rates and migration from rural areas. The result is slums and favelas with inadequate (or non-existent) infrastructure. About a billion city dwellers are living in squatter settlements – one sixth of the world’s population – and during the next twenty years the number of slum-dwellers is expected to double. Hutchison comments: “It is often said that cities reflect the best of urban society; the megacity challenges this belief in urban progress by displaying a vast array of problems that accompany unplanned urban growth.” Fresh ideas, indeed new research into urban studies, are needed to understand and resolve such issues. By 2030, some 80% of the world’s urban population will live in the towns and cities of the developing world. But most of our knowledge of urbanization and urbanism is drawn from the experience of the West. The rate of urbanization is not the only challenge facing cities of the future. Lagos was originally a fishing settlement in the fifteenth century, but it is now the commercial heart of Nigeria. In 1911, its population was some 74,000. Today it is well in excess of 12 million and growing. In the age of global warming such megacities are increasingly vulnerable to catastrophes. As Philip R. Berke says in his essay, “although cities comprise only 1% of the earth’s land area, they concentrate more than half of the world’s population and the majority of its physical capital, including buildings and infrastructure.” The bill for the devastation wrought by Hurricane Katrina on New Orleans was $200 billion, making it the most costly disaster in American history. Eleven of the world’s fifteen largest cities are “highly exposed to one or more natural hazards, including coastal storms, earthquakes and volcanoes”. Tokyo, for example, is prone to earthquakes and is near an active volcano. In 1902, the eruption of Mount Pelée on the island of Martinique buried the entire city of St Pierre, killing 30,000 people. Only one man survived: a prisoner in solitary confinement. As sea levels rise in the coming years and the temperature of the oceans increases, the result will be more frequent and fearsome typhoons and hurricanes. As summers become hotter, water shortages will pose serious problems for many cities (not least in China), as will wildfires, the choking effects of which were endured by the residents of Moscow this year. According to Berke: “The threat of catastrophic events to cities is apparent and rising”. Cities that grow too fast, don’t grow safely. Megacities need to begin planning now for the natural disasters that they will almost certainly face in the future. As the United Nations has said, city living has to be part of the solution to global warming. With rising temperatures and population levels, concentrating people in cities is a highly efficient way of bringing clean water, sanitation, healthcare and energy to mass populations. Public transport systems can also reduce the reliance on individual cars in cities. Urbanization might just save the planet, by reducing our carbon footprint. But as Hutchison says, “there is a long-standing distrust of cities and of urban life in the United Sates”. He points out that it is the only country where universities offer courses with titles such as “Urban Problems”. In Britain, too, there is a historic distrust of the city. In the 1860s, Hippolyte Taine observed that in Britain “the townsman does everything in his power to cease being a townsman, and tries to fit a country house and a bit of country into a corner of the town.” The English have never felt at home in the city. In contrast to Parisians, many Londoners still dream of moving to the suburbs or of owning a home in the country, a dream ruthlessly exploited by countless TV shows. Unfortunately, all too often the city is regarded not as the Promised Land, as it was for the first urbanites, but as Babylon, a place of threatening Otherness, plagued by intractable “urban problems”. Today’s cities are far from ideal and they undoubtedly face many challenges in the coming years. But the answers to those challenges will almost certainly be found in the city itself. For as Mumford and other urbanists have long realised, the city represents humankind’s greatest achievement and resource. In this dynamic, cosmopolitan space lies the wellspring of our creativity as a species.